Diabetic Macular Edema (DME) is defined as an accumulation of fluid in the macula of the retina that controls the vision abilities of the human eye. DME is the disease that is followed by diabetic retinopathy. Diabetic retinopathy is a disease that severely damages the blood vessels of the retina, resulting in vision defects or vision loss. These blood vessels if left untreated begin to exert pressure in the eye and result in fluid leakage, causing DME. 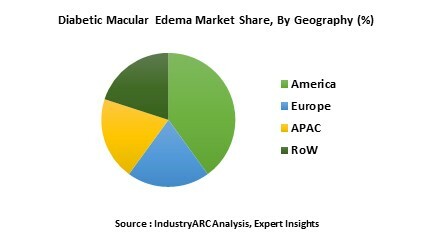 The report “Global Diabetic Macular Edema Market” for the projected period 2016 to 2021 has been segmented on three different parameters. The global DME market has been primarily studied on the basis of different categories of Diabetic Macular Edema as per the Optical Coherence Tomography (OCT ) classification that are Spongiform DME, Cystoid Macular Edema and so on. The Diabetic Macular Edema market has also been studied on the basis of different treatment methods such as Anti-angiogenic drugs injection, Laser treatment and many more. The market has also been studied on the basis of different geographies and the level of population affected by the Diabetic Macular Edema disease in those geographies. As per the study conducted by International Diabetes Federation (IDF), approximately 284 million people, almost equivalent to half of the European population are suffering from visually impairments out of which 39 million of them are totally blind. These kinds of diseases in addition to the human aspects also carry significant social as well as economic impact. Medical organizations and pharmaceuticals companies are investing substantially into R&D, infrastructure and technology to tackle the burden of these chronic diseases. DME only affects a certain percentage of diabetic patients; its percentage is likely to grow in the coming years. The number of people suffering from diabetes in Europe is speculated to rise from 55.2 million in 2010 to 66.2 million by 2030, DME cases would increase proportionately. There are several anti VEGF compounds which are being manufactured and currently into research phase. Asia-Pacific region is expected to be one of the emerging markets for DME treatment, as the diabetic population in the developing nations such as India, China and Indonesia are pacing up exponentially. T0he Diabetic Macular Edema market report also comprises of the leading companies profiled in an extremely descriptive manner. The company profiles include financial summaries, strategies, recent developments and product portfolios of the leading companies in the Diabetic Macular Edema market. The report also incorporates a profound study of the market entropy, market forces and strategic analysis of the Diabetic Macular Edema market.